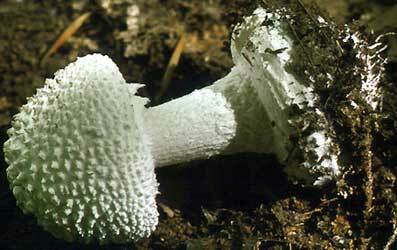 english name "American Abrupt-Bulbed Lepidella"
1. Amanita abrupta, Pine Barrens, Middlesex Co., New Jersey, U.S.A.
2. Amanita abrupta, Great Smoky Mtns. Nat. Pk., Tennessee, U.S.A.
3. Amanita abrupta, Great Smoky Mtns. Nat. Pk., Tennessee, U.S.A.
4. Amanita abrupta, L. R. Hesler photo in TENN.
intro The following is based on original research of RET. 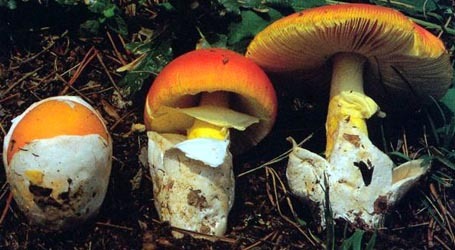 The cap of Amanita abrupta is 30 - 90 mm wide, white, sometimes with brick colored stains, subglobose to hemispherical at first, then broadly subcampanulate to convex, becoming planoconvex or planar, eventually with depressed disc, shiny when dry; context white, unchanging when cut or bruised, 4 - 7 mm thick over stipe; the margin is nonstriate (except possibly in age), decurved, appendiculate at first with fibrillose white narrow nearly continuous band descending from pileus margin. The volva on the cap is present as acutely pointed pyramidal to subconic warts (1 - 2 mm high and 1 - 2 mm wide at base) over much of pileus and finer scales near margin, white, sometimes becoming tannish with age, densely distributed, easily removed. The gills of A. abrupta are narrowly adnate to free, with a decurrent tooth on the stipe apex or with a decurrent line on the upper stipe, close to subdistant, white to cream to white with pale ochraceous or orangish tint in mass, white in side view, unchanging when cut or bruised, 5 - 8.5 mm broad, broadest toward pileus margin, with edges finely fibriate and yellowing slightly with age; the short gills are attenuate. The stipe is 70 - 81 × 6 - 10 mm, white, faintly browning from handling, narrowing upward, flaring at apex, often pubescent above annulus, fibrillose below, sometimes flocculose or tomentose on lower portion above the bulb. The bulb is 14 - 30 × 14 - 33 mm and abrupt; it is subnapiform or rounded or somewhat flattened below and occasionally exhibits some longitudinal splitting; in addition, it usually has concentric low ridges on its upper surface and several to many white mycelical threads on its very base. The context of the stipe is white, unchanging when cut or bruised or yellowing in tissue of central cylinder, usually solid or firmly stuffed, with central cylinder 1.5 - 3 mm wide and only notable when the tissue is watersoaked. 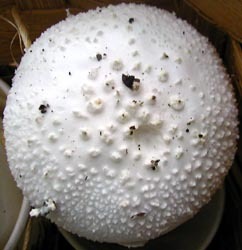 The annulus is subapical to superior, white, sometimes with yellow stains, membranous, skirt-like, rather thick, with thickened margin, striate above, felted underneath, often having underside connected to lower stipe surface by numerous white fibrils; volva sometimes appearing as scattered small floccose white warts easily missed during collecting and left in substrate or as a patch on lower stipe and/or as thin ridges and rings on top and upper part of sides of bulb. Odor of this species is in the "decaying protein" group. The taste is not recorded. The spores are (6.1-) 7.2 - 9.0 (-10.7) x (4.8-) 5.9 - 7.5 (-9.2) µm and are subglobose to broadly ellipsoid to ellipsoid and amyloid. Clamps are present on bases of basidia. The species occurs in deciduous, coniferous, and mixed forests with beech, birch, fir, hemlock (Tsuga), oak, pine, and poplar. The range of A. abrupta extends from Ontario and Québec, Canada to Georgia and Texas, U.S.A. and westward to the eastern limit of treeless prairie. author Peck. 1897. Bull. Torrey Bot. Club 24: 138. ≡Lepidella abrupta (Peck) E.-J. Gilbert. 1928. Bull. Trimestriel Soc. Mycol. 44: 151, figs. ??. ≡Aspidella abrupta (Peck) E.-J. Gilbert. 1940. Iconogr. Mycol. (Milan) 27, suppl. (1): 79, tab. 57 (figs. 3-4). type studies Jenkins. 1978a. Mycotaxon 7: 24.
revisions Bas. 1969. Persoonia 5: 432, figs. 164-166. The following material is derived from (Bas 1969) and (Jenkins 1978a) when cited and otherwise is based on original research by R. E. Tulloss. pileus 30 - 90 mm wide, white, sometimes with brick colored stains, subglobose to hemispherical at first, then broadly subcampanulate to convex, becoming planoconvex or planar, eventually with depressed disc, shiny when dry; context white, unchanging when cut or bruised, 4 - 7 mm thick over stipe, thinning ?? toward margin; margin nonstriate (except possibly in age), decurved, appendiculate at first with fibrillose white narrow nearly continuous band descending from pileus margin; universal veil as acutely pointed pyramidal to subconic warts (1-2 mm high and 1-2 mm wide at base) over much of pileus and fine scales near margin, white, sometimes becoming tannish with age, pulverulent, densely distributed, detersile. lamellae narrowly adnate to free, with decurrent tooth on stipe apex or with decurrent line on upper stipe, close to subdistant (Lewis 3301), white to cream to white with pale ochraceous or orangish tint in mass, white in side view, unchanging when cut or bruised, 5 - 8.5 mm broad, broadest toward pileus margin, with edges finely fibriate and yellowing slightly with age; lamellulae attenuate to attenuate with tooth at juncture with pileus context, ??. stipe 70 - 81 × 6 - 10 mm, white, faintly browning from handling, narrowing upward, flaring at apex, often pubescent above annulus, fibrillose below, sometimes flocculose or tomentose on lower portion above bulb; bulb 14 - 30 × 14 - 33 mm, abrupt, subnapiform or rounded or somewhat flattened below, occasionally with some longitudinal splitting, with concentric low ridges on upper flat surface, with several to many white mycelical threads at very base; context white, unchanging when cut or bruised or yellowing in tissue of central cylinder, solid or firmly stuffed, occasionally with lacuna in upper part, with central cylinder 1.5 - 3 mm wide and only notable when tissue watersoaked also reported by Coker (1917: 72); partial veil subapical to superior, white, sometimes with yellow stains, membranous, skirt-like, pendent, rather thick, with thickened margin, striate above, felted underneath, often having underside connected to lower stipe surface by numerous white fibrils, ?? ; universal veil sometimes as scattered small floccose white warts easily missed during collecting and left in substrate or as patch on lower stipe and/or as thin ridges and rings on top and upper part of sides of bulb. odor/taste Odor in the “chlorine” group. Taste not recorded. tests Spot test for laccase (syringaldazine) - In "button" specimen, positive in warts on pileus, on most of surface of stipe and bulb, outlining otherwise not apparent central cylinder, faintly in bulb and lower stipe, and in line in pileus context running parallel to upper edge of lamellae; in specimen with expanded stipe and lamellae still covered by partial veil, positive everywhere except lamellae, region of pileus context immediately adjacent to upper edge of lamellae and top end of stipe context, strip of stipe context immediately adjacent to stipe surface, and spot in stipe base interior near top of bulb; in mature material, positive in upper part of pileus context, outermost part of stipe and bulb contexts, and edges of lamellae; in all cases, positive reaction strong and developing rapidly, then fading rather distinctly and being replaced by rusty brown to ochraceous to orange-yellow to bright yellow stains (especially in universal veil remnants). Spot test for tyrosinase (paracresol) - Entirely negative in "buttons" and in specimen with expanded stipe and partial veil still covering lamellae; in mature material, positive on a few wart tips, faintly in spots in stipe context, and moderately intensely in region several mm broad in bulb context running parallel to, but separated from, lower bulb surface. Test vouchers: Tulloss 8-24-85-J, 8-4-95-A, 8-5-95-B. pileipellis 30 - 70 µm thick, with acrophysalides of pileus context visible near surface, lacking distinct suprapellis, barely gelatinized at surface; filamentous, undifferentiated hyphae 1.5 - 14.5 µm wide, branching, thin-walled, often constricted at septa, singly or in fascicles, with numerous subradial fascicles and loosely interwoven and often curved hyphae criss-crossing, occasionally with yellowish subrefractive walls, with inflated tip cells (e.g., 63 × 15.5 µm, clavate to subfusiform; vascular hyphae not observed; clamps present, prominent when seen at (1250×), “small” per Bas (1969). lamella trama bilateral, divergent; wcs = 35 - 40 µm; central stratum lacking markedly inflated intercalary elements; subhymenial base as frequently branching structure of uninflated and partially inflated elements, with hyphal segments somewhat longer than thos of subhymenium; filamentous, undifferentiated hyphae 1.0 - 6.0 µm wide, branching, with some slightly inflated intercalary segments; terminal, inflated cells not observed; vascular hyphae 3.0 - 6.5 µm wide, branching, occasional; clamps occasional, prominent when present. basidia 35 - 52 × 9.7 - 13.0 µm, almost exclusively 4-, rarely 3-sterigmate, with sterigmata up to 5.5 × 3.2 µm; clamps and proliferated clamps occasional, often prominent when present. stipe context longitudinally acrophysalidic; ?? Bas (1969): [40/3/3] 7.0 - 9.5 × 6.0 - 8.5 μm, (Q = 1.0 - 1.40 (-1.60); Q = 1.10 - 1.35), colorless, hyaline, thin-walled, amyloid, globose to subglobose to broadly ellipsoid to ellipsoid; apiculus not described; contents guttulate; color in deposit not recorded. 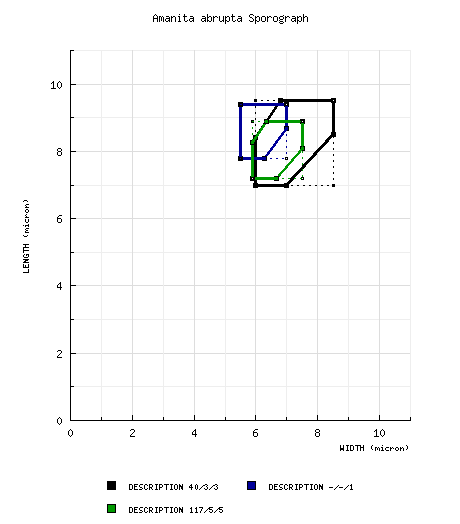 from type study of Jenkins (1978a): [-/-/1] 7.8 - 9.4 × 5.5 - 7.0 μm, (Q = 1.24 - 1.71; Q' = 1.46), hyaline, thin-walled amyloid, broadly ellipsoid to ellipsoid to elongate, often adaxially flattened; apiculus sublateral, cylindric to truncate-conic; contents guttulate; color in deposit not recorded. RET: [117/5/5] (6.1-) 7.2 - 8.9 (-10.7) × (4.8-) 5.9 - 7.5 (-9.2) µm, (L = 7.9 - 8.5 µm; L’ = 8.1 µm; W = 6.1 - 6.8 µm; W’ = 6.6 µm; Q = (1.04-) 1.08 - 1.40 (-1.61); Q = 1.17 - 1.32; Q’ = 1.22), hyaline, colorless, smooth, thin-walled,amyloid, subglobose to broadly ellipsoid to ellipsoid; apiculus sublateral, cylindric, rather small; contents monoguttulate to granular; white in deposit. ecology Solitary to subgregarious. Maine: In wooded patch with Picea, Populus, and Quercus. New Jersey: In loam of Quercus-Fagus forest or in sandy soil (under litter) of typical Pine-Oak barrens—with Quercus alba, Q. rubra?, Pinus rigida, Acer rubrum, Nyssa sylvatica, and Prunus sp or with Q. alba, Q. palustris, Q. marilandica, Q. spp., P. rigida, N. sylvatica, and Sassafras albidum with Vaccinium plentiful in understory. New York: With Tsuga canadensis in mixed forest including also Pinus, Abies, Quercus, Liriodendron tulipifera, Betula, Fagus, Populus, Acer, Fraxinus, and other hardwoods. Pennsylvania: In wet site by stream in mixed forest with Tsuga canadensis, P. strobus, and Betula allegheniensis. material examined Bas (1969): U.S.A.: ALABAMA—Lee Co. - Auburn, vii.1896 L. M. Underwood s.n. (holotype, NYS). IOWA—Johnson Co. - Iowa City, 19.ix.1942 G. W. Martin s.n. (MICH). TENNESSEE—Knox Co. - ca. Knoxville, 16.viii.1942 L. R. Hesler 14388 (TENN; L). type study of Jenkins (1978a): U.S.A.: ALABAMA— Lee Co. - Auburn, vii.1896 L. M. Underwood s.n. (holotype, NYS). CANADA: QUÉBEC—??. U.S.A.: CONNECTICUT—Middlesex Co. - Salmon River St. For. (South) [41°32’58” N/ 72°27’01” W, 21 m], 3.ix.2011 Bill Yule s.n. [Tulloss 9-3-11-D] (RET 491-8). GEORGIA—Rabun Co. - Warwoman Wildlife Mgmt. Area, 2.viii.1991 R. P. Bhatt 154 (VPI? n.v.). INDIANA—Monroe Co. - Bloomington, Griffey Lk. [39.2010° N/ 86.5188° W, 202 m], 30.viii.2012 Stephen Russell s.n. [mushroomobserver.org #107846] (RET 533-7). MAINE—Cumberland Co. - Cumberland Center, s.d. S. S. Ristich 7-28-86-SSR1 (RET 091-3). Knox Co. - Cushing, 1.x.2010 Leslie Land s.n. (RET 453-6); Cushing, 192 Hathorne Pt. Rd., Peter Bulkley’s woods, 3.ix.2008 Wm. Bakaitis s.n. (RET 426-4); Rockland, Rockland Bog, 31.viii.2011 Wm. Bakaitis & Leslie Land s.n. (RET 494-3). Lincoln Co. - Waldoboro, E of Dutch Neck Rd., N of rd. to boat ramp on W bank of Medomak R. [44°02'21.66" N/ 69°22'18.38" W], 5.viii.1996 W. Bakaitis s.n. (NYS D1591). MASSACHUSETTS—Essex Co. - Bald Hill near Boxford St. For., 21.ix.1991 Rob Moir 9-21-91-D (RET 032-8). NEW HAMPSHIRE—Carroll Co. - Sandwich, Sandwich Fair Grounds, 11.viii.2012 Rick van de Poll s.n. (RET 509-1). NEW JERSEY—Atlantic Co. - along Tuckahoe R., 18.viii.1984 "R.C.S." s.n. [Tulloss 8-18-84-C] (RET 050-8). Camden Co. - Wharton St. For., 18.viii.1984 ?? 8-18-84-C (RET ??). Hunterdon Co. - Clinton Twp., Echo Hill Co. Pk., 27.vii.1994 S. Hopkins s.n. (RET 133-2). Mercer Co. - Hopewell Twp., off Carter Rd., woods behind AT&T/Lucent research labs [40°21’39” N/ 74°43’29” W, 63 m], 10.ix.1979 R. E. Tulloss 9-10-79-C (in herb. D. T. Jenkins). Middlesex Co. - Jamesburg Twp., Jamesburg Twp. Pk., ca. Helmetta [40°23’07” N/ 74°25’48” W], 2.x.1983 A. Norarevian & E. R. Yetter s.n. [Tulloss 10-2-83-A] (RET 353-6), 24.viii.1985 R. E. Tulloss 8-24-85-J (RET 099-5). Monmouth Co. - Shark River Co. Pk. [40°12’18” N/ 74°05’44” W, 16 m], 28.viii.1985 R. E. Tulloss 8-28-85-C (RET 098-6), 3.viii.1986 Eric James s.n. [Tulloss 8-3-86-J] (RET 090-8). NEW YORK—Onondaga Co. - NW of Beaver Lk., 4.viii.1995 Yves Lamoureux s.n. [Tulloss 8-4-95-A] (RET 0154-3); Syracuse, Rand Tract, 5.viii.1995 Connie Borodenko s.n. [Tulloss 8-5-95-B] (RET 0154-4). NORTH CAROLINA—Macon Co. - Blue Valley, 27.vii.1991 R. P. Bhatt 118 (VPI? n.v.). PENNSYLVANIA—Clarion Co. - Cook Forest St. Pk., 13.viii.1986 Walter Sturgeon s.n. [Tulloss 8-13-86-WS1] (RET 466-2). TENNESSEE— Sevier Co. - Ca. Gatlinburg, GSMNP, Cherokee Orchard [35.6811° N/ 83.4625° W, 945 m], 12.vii.2004 R. E. Tulloss 7-12-04-H (RET 373-10). TEXAS—?? Co. - ?H&H, ?Grey, ca. Baygall, TCU? Tr. S end, ca. first long bridge, 12-15.viii.1982 David P. Lewis 3301 (F, n.v.; RET 013-5). VERMONT—Bennington Co. - ca. Bennington, Bennington Fish Culture Stn. [42°51'10" N/ 73°10'12" W, 288 m], 24.viii.1980 M. A. King & R. E. Tulloss 8-24-80-D (RET 392-5). VIRGINIA—Augusta Co. - Geo. Washington Nat. For., Todd Lake Campground [38°21'55" N/ 79°12'41" W, 610 m], 28.viii.1982 D. C. Tulloss s.n. [Tulloss 8-28-82-A] (RET 176-10). Culpeper Co. - Culpeper, 26.viii.2012 Penny Firth s.n. [mushroomobserver.org #106593] (RET 511-5). L. R. Hesler - (4) Tennessee, with permission of Dr. R. H. Petersen, Curator, L. R. Hesler Herbarium, Univ. of Tenn., Knoxville.